Who doesn’t love a great deal? Well, with South Beach Smoke, we are totally into giving you some sweet savings, and our Deal of the Week gets you something new and awesome every week. That’s right; it’s always different, so you can grab up these goods weekly. This week, the deal is the Aspire Plato All-in-One Vaporizer Kit, which is currently 10% off, for this week only! Talk about savings and exploring all the amazing options! 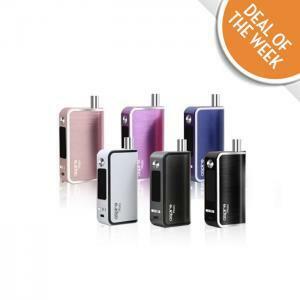 If you’re into vaping and are aiming to try something new, don’t let this deal slip past you. The Aspire Plato can be described as one vaporizer to rule them all; one vaporizer that does it all. As an all-in-one, like the name implies, it’s an all-in-one unit that is comprised of the battery and tank. As an all-in-one, you may expect a difficult time dealing with liquid refills, however, this device was designed differently. It was crafted to include a super simple refill system via the side filling port. The tank is also noteworthy, boasting an incredibly large size at 5.6ml! Powered by just a single 18650 battery, you can expect a lightweight device that powers up for a long time through your vaping. The Aspire Plato All-in-One kit offers everything you need for phenomenal vaping. It provides you with the necessities, plus some extras necessary to get down ‘n dirty with an amazing vaping experience. It promises total convenience, and mad performance. If you want one great kit for vaping, let this be it! The kit includes one Aspire Plato vaporizer, one BVC atomizer with a pre-installed 1.8 ohm coil, one sub ohm atomizer cartridge with a 0.4 ohm Kanthal Clapton coil, one stainless steel drip tip, one Delrin drip tip, one Aspire 2500 mAh 20A 18650 battery, one micro USB cable, and one key. Furthermore, the Aspire Plato is available in your choice of 6 gorgeous colors: Black, Dark Blue, Grey, Pink, Rose Gold, and White. The wattage range on this device runs from 1 – 50W, with a temperature range from 200° – 600°. Adjustable airflow enables the option to control the flow of air into the device to ensure you get the optimal hit. You have the option to use a variety of different coils, and have the added benefit of two juice ports. Sounds good, doesn’t it? The options for high-performance are many, and the actual workings on the Aspire Plato are beautifully simple. Consider this the best of all worlds where vaping is considered; simplicity and precision result in a very fun mod! South Beach Smoke is so excited to be offering a new Deal of the Week every week because giving you added savings on the good stuff makes for a mutually beneficial scenario for all parties involved. Our current deal is no different! Normally priced at $54.95, for this week only, you can save 10% on the fabulous Aspire Plato All-in-One Vaporizer Kit and we suggest you jump on it! This kind of deal on a device this advanced is definitely something to score. We hope these savings make your week go by a little brighter, so take advantage, save some cash, and get your hands on this amazing starter kit that hooks you up with pure vaping awesomeness! Can Electronic Cigarettes be Used Indoors?